Sorry for the delay in posting, but our internet connection went out yesterday. One of the challenges of mountain living is finding a dependable internet provider, as we don’t have cable in this neck of the woods. We use a provider that uses microwave technology, and it seems to break down on any given day for no reason. Anyway, we just returned back from a week in Winter Park, Colorado, another mountain town, for a week of skiing, both downhill and nordic. This is a tradition we started three years ago, after getting to know the weather patterns, and skier patterns. We determined the first week in March to be the optimal time for most favorable skiing conditions, but still before all the spring break crowds invade Colorado. We had a great time, not only downhill skiing, but doing some nordic skiing at nearby Devils Thumb in Fraser, just up the road. One of the things I love about traveling to different mountain towns is finding a great place for breakfast. Thanks to the wonders of the internet, and more particularly sites like Yelp, it seems you can always find a place the locals frequent — some cute, independent diner type place that has a yummy breakfast. In Winter Park, this trip we discovered the Mountain Rose Cafe, a cute little cabin-like place with about ten tables, packed on a week day, serving up yummy food, like the Venetian Frittata I had with home-made sourdough toast. When we were in Steamboat awhile ago, we discovered the wonderful Winona’s, a cute little place on the main drag. Even during a week day, we had to wait awhile to get a table, but it was well worth it for the heaping portions of potatoes and various egg scrambles you get. But the thing that really caught our eye, was the waitress serving the most enormous, luscious looking cinammon roll we had ever seen. It looked like a small cake on the plate. We couldn’t help herself, and had to order one that we took to go. I think it took me two days to finish the whole thing. 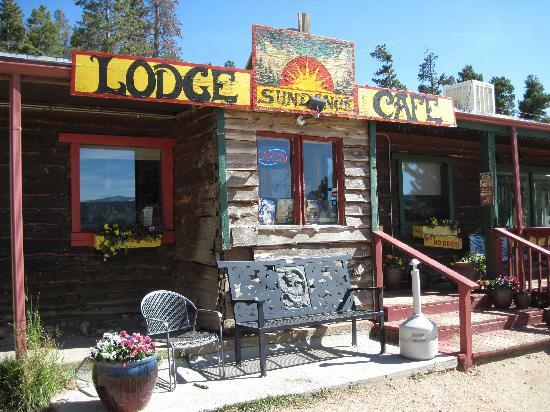 Here in Nederland, our chosen breakfast stop is The Sundance Cafe, and it fits the mountain cafe persona perfectly, making its home just south of town off the Peak to Peak highway in well worn, log-hewn building attached to a 1-room motel. It has a little deck off the side with a gorgeous view of the Indian Peaks. My favorite dish there is the Mountain Scramble, an egg scramble with cheese, peppers, mushrooms and other veggies with a side of potatoes. Part of the fun of traveling to each new mountain town here in Colorado is finding that local cafe. Because there’s nothing like a great breakfast at the local cafe in town to get you powered up for a day of skiing or a day of hiking!